Todd Dutiaume is looking forward to introducing some healthy competition into the Fife Flyers line-up after declaring all his imports fit for action. With Rick Pinkston set for a return from injury this weekend, Dutiaume now faces a decision over which import to leave out, with 15 players competing for only 14 slots. It’s a luxury the Fife head coach has rarely had during his time in the Elite League, with the ability to utilise a spare import often cancelled out by injury. But Dutiaume is hopeful that his team can remain healthy until the end of the season, giving him the option to rest and rotate his import forwards. “It gives me positive leverage, and makes for healthy competition in the line-up,” he said. “Nobody wants to be guy who gets the tap on shoulder after warm-up and told they are sitting out. “Positive competition is a good thing and a lot of teams above us have that option, some below us even have it. 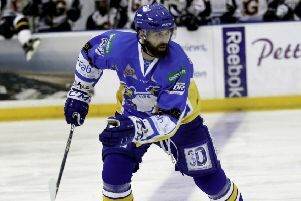 Pinkston’s return will provide a boost to a defence that has shipped 20 goals over the past two weekends, although both coaches were keen to stress that the blame is not solely on the D, with only one of the seven goals conceded to Manchester Storm on Sunday attributed to a defenceman’s error. “Because it ends up in the back of the net, it’s blamed on the guy standing in front of Owen, not the rest of the guys on the ice,” Dutiaume said. “You have to look up ice to see what happened. “If someone started behind their net, skated all the way through our entire team and scored, there’s an issue. “But if we’re skating forward and turn the puck over on the offensive blueline, and everyone’s momentum is going forward, that’s where you get odd-man situations from. “For big portions of the season we’ve managed not to give up odd-man rushes, because as everyone knows, that’s the way we play. “But in Manchester we gave up four three-on-twos, which is just something we don’t do. If you turn pucks over in that small building, that’s the way it goes. “Any team coming down on a two-on-one or three-on-two, you could have the best D-man in the world, but he’s outnumbered. “We’re not quick to blame certain position groups here. Do guys need to pick up the consistency of their game? Yes, absolutely. “But it should be apparent to anyone who watches us then when we play the right way, we’re fine. But it’s not a Fife Flyers issue. It’s a cross-league issue. This weekend Flyers travel to Guildford Flames on Saturday before welcoming Nottingham Panthers, who this week sacked coach Rich Chernomaz, to Kirkcaldy on Sunday for their third match of a Scottish triple-header. Flyers are seven points behind third-placed Panthers but have five games in hand. In the opposite direction, only five points now separate Fife from eighth-placed Dundee. “It’s probably the most interesting the league has ever been,” Dutiaume said.